The Nexus 6 saw severe criticisms directed against it by irate fans and other alike for its ridiculously high price tag at the time of launch. The 32 GB Nexus 6 will end up costing you $649.9 while the 64 GB variant will set you back for around $699. Before the arrival of Nexus 6, Google’s Nexus devices were known to be an affordable bunch, with good specs, reasonable price and stock Android. Well, for those of you who still have faith in Google and the Nexus lineup, and want to experience the device’s Snapdragon 805 glory all for yourself, T-Mobile has a solution for you. Nexus 6 Available From T-Mobile With $0 Down Payment and Monthly Installments Of $ $27. You can now get the 32 GB Nexus 6 from T-Mobile for only $27 a month, and that too with $0 down payment for the device at the time of purchase. The $27 down payments for the Nexus 6 will last for 24 months. For those of you with more storage needs, the carrier also has the 64 GB Nexus 6 in its portfolio. 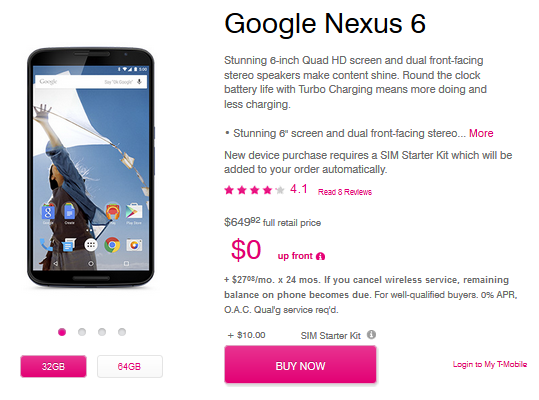 T-Mobile is offering the 64 GB variant of the Nexus 6 for $29 a month, with a similar $0 down payment. The $29 charge will last you for a similar 24 months. With its Snapdragon 805 and an updated Adreno GPU on board, the Nexus 6 is a must have for any Android lover. This should be boosted by the fact that the device will come running stock Android L, which has not been widely ported to many major manufacturers today. The Nexus 6 has a 5.9 inch screen with a rear camera resolution of 13 MP, which should be more than enough for your daily photography needs. Android Lollipop itself comes with several enhancements on board, such as Google’s Material Design interface, improved fluidity, better privacy and security features and improved battery consumption. So is T-Mobile’s deal convincing enough for you? Let us know what you think in the comments section. Head over to there site for more details.